Buddy the Elf's maple syrup-soaked spaghetti offers inspiration for this disturbing but festive new dish. It's not even Thanksgiving, yet people are already getting into the Christmas spirit. For one Chicago restaurant, that means serving dessert spaghetti topped with syrup, Pop Tarts, and Oreos to honor the 15th anniversary of the holiday classic Elf. 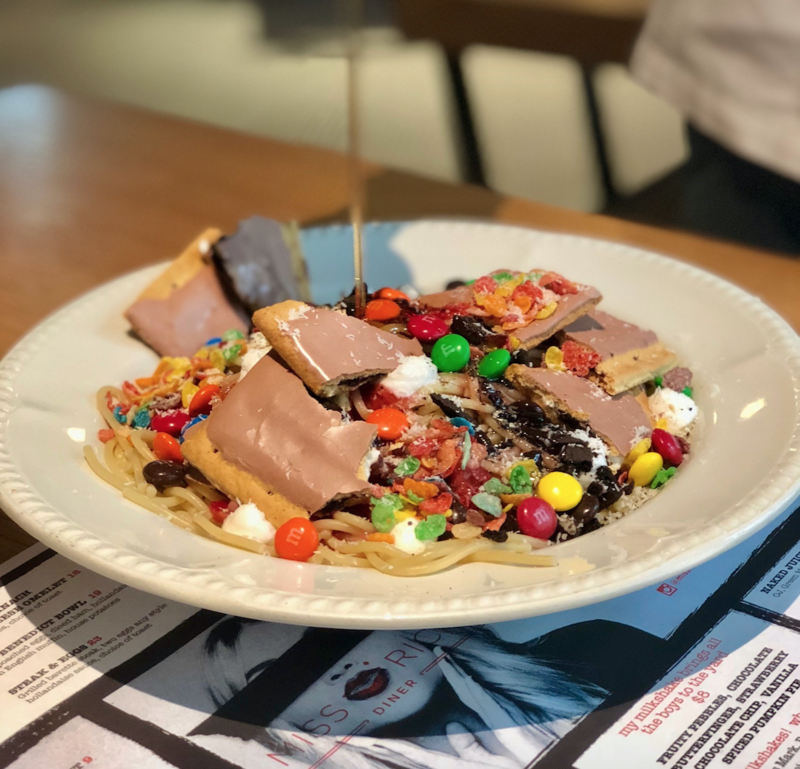 The "Spaghetti Sundae," which will be served at Chicago's Miss Ricky's from November 7 through December 25, is inspired by a scene in Elf where Buddy the Elf, played by Will Ferrell, casually tops his spaghetti with syrup and an assortment of cookies, candies, and marshmallows, all as part of a balanced breakfast. At Miss Ricky's, the dish will cost $15, which seems like a steep price to pay for a highly-Instagrammable but highly-inedible food item, but it could be worth it for the novelty of eating something so ridiculous. The restaurant's executive chef, Moosah Reaume, tops his colorful take on the dish with strawberry and raspberry sauce, marshmallows, S'mores Pop-Tarts, M&Ms, Oreos, Fruity Pebbles, coconut, syrup, and chocolate sauce. Over the years, several fans have made this dish at home (just do a quick search on YouTube), and the results seem to be ... pretty rough, but definitely entertaining. November 1 has clearly become the unofficial start date of holiday-season hysteria, what with advent calendars already selling out and Black Friday sales starting long before Thanksgiving. If you're already getting into the Christmas spirit, we recommend getting a head start on your holiday planning—these festive train rides around the country make delightful December outtings. But don't forget to give Thanksgiving the love it deserves! We've got you covered for all of your turkey day needs. Miss Ricky's, Virgin Hotels Chicago, 203 N. Wabash. Open daily from 7 a.m. to 2:30 p.m.